To delete records from Salesforce.com in bulk using G-Connector, you will only need a column of record IDs in your Excel spreadsheet. 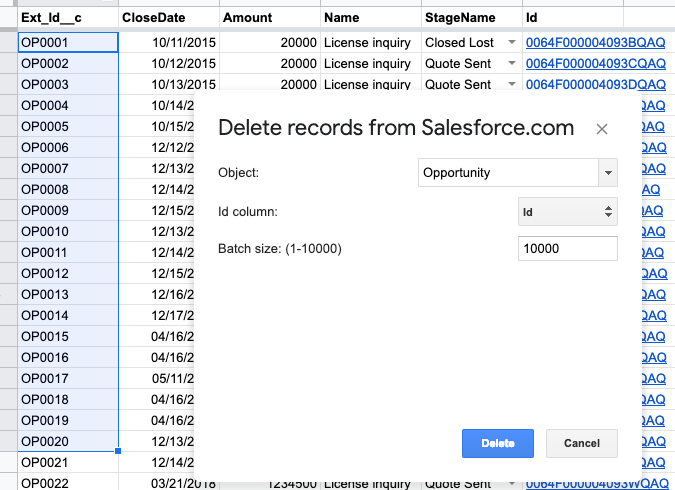 So as long as you have a column of record IDs in your spreadsheet, you can select the rows you want deleted from the Salesforce.com database, click Add-ons -> G-Connector for Salesforce -> Delete , and confirm the deletion. Records deleted by the Delete operation from G-Connector can be restored from the Salesforce.com Recycle Bin for the first 30 days after deletion.